Archives : DISINVESTMENT STORY BEGINS - 29/05/2009. IMPORTANT: It has been noted that the Weekly Journal Informed Investor has been trying to tarnish my reputation for their own selfish motives. If any one has any grievance with me or my assocites, please feel free to contact me and get it solved.Appropriate action will be taken against those trying to tarnish my image and reputation. DISINVESTMENT STORY BEGINS - 29/05/2009. It was a week full of politics drama and suspense over who will be assigned which critical portfolios. As it turned out, right men were selected for right job. The most important Finance Portfolio was begged by Mr. Pranab Mukherjee. He immediately started making positive noises after taking oath as Finance Minister. The Oil Ministry was begged by Mr. Murli Deora for the second consecutive term, while Mr. P.Chidambaram was retained as the Home minister. DISINVESTMENT: THE THING GOING FORWARD. DE-REGULARIZATION IN OIL PRICES FINALLY. The new cabinet ministers started making positive noises about disinvestment allowing further increase in FDI and various other forms of stimuli. This government will now go further with disinvestment as it had promised last time but could not do because of the pressure by the Left. This time the government will see to it that the disinvestment reaches its logical end. This will keep government owned PSU stocks in focus. The Petroleum minister immediately announced on Friday that the oil prices will be de-regularized and there will not be any control or any mechanism to control oil prices. The proposal will be submitted in a few days and this induced a strong wave of buying in the Oil Marketing Companies. The buying frenzy was seen in HPCL, BPCL & IOC which then started rubbing off on ONGC & Reliance. Sensex opened the week at 13988, made a high of 14727, made a low of 13518, and closed at 14625, thus registering a weekly gain of 738 points. Sensex has formed Three White Soldiers Bullish reversal pattern from Wednesday to Friday, The Sensex was experiencing profit booking till Tuesday, but next three days saw strong buying and due to which a white candle with long lower shadow was formed on the weekly charts. Profit booking was seen till Tuesday when Sensex touched a low of 13518 but did not breach the support of 13479. Thus the gap between 13479-12219 on the daily as well as weekly chart remains. The Sensex was finding difficult to cross the 100 Week MA (14290), but managed to close the week above that and as a result further positive momentum will be seen. Now the 100 Week MA (14290) and the 200 Week MA (12845) will act as a supports. The Sensex moved inside the previous week’s range of 13479-14930, making it an Inside day on the weekly charts. 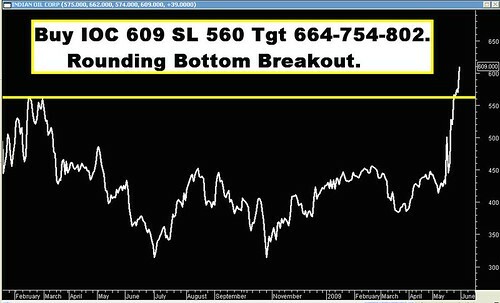 It means that the Sensex will gain further momentum when it breaks the previous week’s range in any one of the direction. The Sensex is correcting the entire fall from 21206 to 7697. It has managed to close above the 50% retracement level which was at 14452 and now proceed towards the 61.8% retracement target which is at 15965. The indicators like the MACD & ROC are already in positive territory and are continuing with their Buy signals. The RSI is at 73 and is pointing upwards, indicating further bullish momentum. For the week ahead the Resistance is at 15107-15579-15868. Support is at 14290-14002-13471. Nifty opened the week at 4238, made a high of 4488, low of 4092, and closed at 4448. Thus the weekly gain was 210 points. Nifty has formed Three White Soldiers Bullish reversal pattern from Wednesday to Friday, The Nifty was experiencing profit booking till Tuesday, but next three days saw strong buying and due to which a white candle with long lower shadow was formed on the weekly charts. The Nifty formed a Bullish Engulfing pattern which led to the reversal. The Nifty was finding difficult to cross the 100 Week MA (4279), but managed to close the week above that and as a result further positive momentum will be seen. Now the 100 Week MA (4279) and the 200 Week MA (3817) will act as a supports. The Nifty is correcting the entire fall from 6357-2252. It has managed to close above the 50% retracement level which was at 4305 and now proceed towards the 61.8% retracement target which is at 4764. The Nifty OI PCR is at 1.12, which is quite healthy considering the bullish momentum prevailing in the market. Nifty strike of 4300 have seen a strong addition in Open Interest which indicates strong PUT writing and Nifty strike of 4600 has seen strong CALL writing. 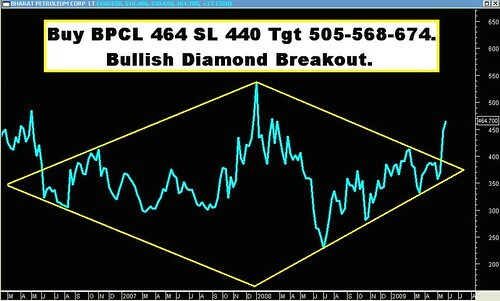 Thus the Nifty is expected to move in a range of 4300-4600 in the near term. For the week ahead, the Resistance is at 4649-4803-5070. Support is at 4279-4092-3790. It was a super duper success as all the stocks rocketed upwards. Only Tech Mahindra and FSL are yet to reach their targets, which may be reached this week. 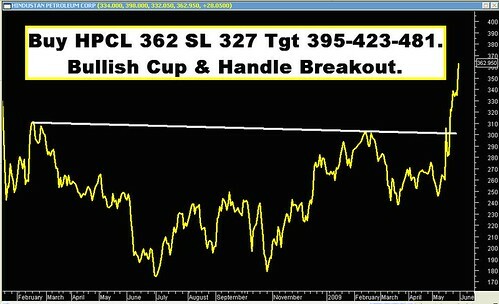 The Oil Marketing Companies have given a strong breakout and it is advised to buy at lower levels as all three HPCL, BPCL and IOC have given strong breakouts. Buy from a medium term perspective of 45 days to 60 days.